The weather this morning was magnificent, but still no wind. The dinghy outboard just stopped last night so I gave that a few pulls before deciding that it was probably water in the petrol. I wanted to get to Port Hinchinbrook for fuel so I decided to look at that later. After a breakfast of fruit, muesli, toast, eggs, and marmalade we weighed anchor and headed towards the channel. We are baking our own bread aboard Dreamagic now so together with the yoghurt making we are becoming a regular greenie troupe. 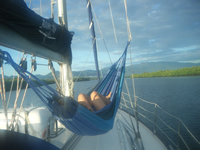 The boat settled down to getting the chores out of the way and then reading, listening to music or just dreaming our way across the flat water of Rockingham Bay. Claire had noticed in the pilot book that there was supposed to be good diving off Goold Island so we detoured there. The visibility was poor though and our sounder indicated that the bottom was very rocky. I just held the boat on its motor without putting the anchor down while Claire, Christian and Isobelle had a swim. 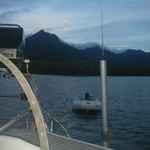 Port Hinchinbrook is the last fuel before Rockhampton so we entered the channel and took 80 litres. The Port is actually a canal development built with much controversy by Keith Williams in the eighties. The fuel wharf is actually a private house at the far end of the development and obviously hated by its residential neighbours. Before even getting off the boat I had to sign a waiver that made me personally liable for any contamination of the water. Typical of canal developments, and not unlike the Blue Water development in Cairns, the owners of the waterfront blocks want it to be a private paradise, but want the public they are so desperate to exclude to contribute their rates to its upkeep. Hinchinbrook is almost unnavigable at anything below half tide, and even then only through a tight, convoluted secondary channel temporarily marked inside the main one, We ploughed our way through on the entry but with a falling tide became fast on our exit. Fortunately a speedboat was returning and with the aid of his motor and ours we got back into the main channel, saving a 4 hour delay. 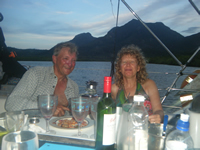 We motored down the Hinchinbrook Channel and anchored in a Gayundah Creek on the Island side. I pulled the outboard apart while a dinner of steak, pasta and Bolognese sauce was prepared. Good night was at about 8.00pm!